Founder and proprietor of the London "Daily Telegraph"; born Dec. 15, 1812; died at Ramsgate Oct. 12, 1888. He was educated in London and Germany. After spending the earlier part of his life in commercial pursuits he became the owner of a printing establishment near Fleet street. In this way he became connected with the "Sunday Times," of which he was chief proprietor in 1855. The "Daily Telegraph and Courier" was founded in June, 1855, and by September had come entirely under Levy's management, who reduced its price, making it the first London penny daily paper; and it was through his genius that it became a great power in journalism. When he assumed the proprietorship of the paper its fortunes were at so low an ebb that the purchase-money was only £1,000. Levy worked in the interests of the paper with unflagging zeal, many members of his family also becoming connected with it; and he collected round him a band of able writers, including Sir E. Arnold and G. A. Sala. In politics the paper was Liberal until 1886, when Liberal-Unionist principles were adopted. 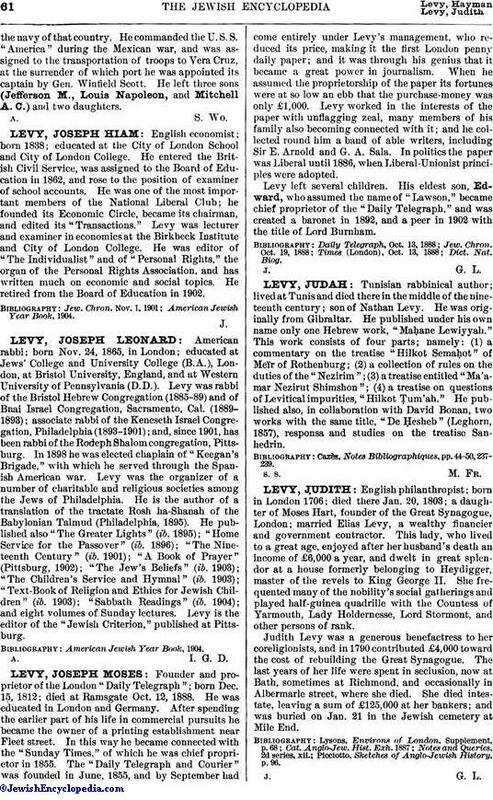 Levy left several children. His eldest son, Edward, who assumed the name of "Lawson," became chief proprietor of the "Daily Telegraph," and was created a baronet in 1892, and a peer in 1902 with the title of Lord Burnham.